Many dreams are inherently related to emotions and feelings experienced while dreaming, for example soothing and comforting feelings of warm summer rain, feeling secure and protected while observing rain falling outside in bad weather from inside the house , or expression of loneliness and discomfort while being caught in the cold rain on the street and so on. 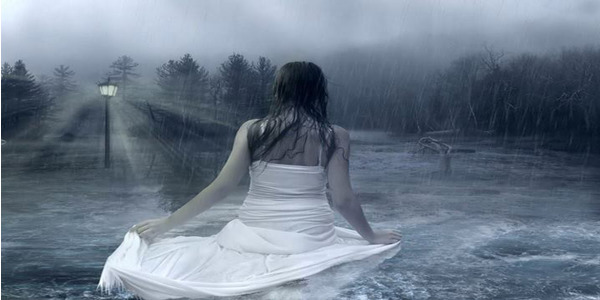 For some people, while experiencing dreams about rain, the visions can evoke feelings of stressful and worrisome existence, some kind of disturbance or effects which result in excessive introversion, low self-esteem and depression projected into wake life. Psychological aspects of experiencing these kinds of visions can add to formation of complexes and states negatively affecting person’s life, especially if dreams are recurring in their nature. While trying to find a meaningful explanation of a dream about rain, try to recall details pertaining to the situation: were you alone or with other people in the rain, what was rain’s intensity, was it accompanied by some environmental conditions such as thunder or lightning, what was the feeling you experienced in this dream? Other recollections could be related to the impact which rain had on you in your dream. Interpretation of a vision when you did not feel comfortable in the cold rain could be quite different from an event when you happened to notice other people or kids enjoying a light summer drizzle. The negative or positive outcome of such experience can change dramatically based on details you bring back from your subconscious visions related to rain and rain-related events.